Would you like to make something with Oakshott fabrics? Well now, you have a chance. Each month, Michael Oakshott and I choose an Oakshott bundle and challenge you to come up with some kind of wonderful idea of what you would make with it. This month we're offering two packs, one for July and one for August. The fabrics on offer are F8 packs of the the new lines shot with grey and blue (which I think of as Dusk and Midnight). Leave a comment letting me know what you would make with these fabrics and which bundle you would choose, Dusk or Midnight. You can leave two comments, one for each bundle if you have ideas for each bundle. Be specific about your idea. We won't pick someone who says "I want to make a quilt" but might pick someone who says "I have in mind a quilt with ohio star blocks and I would mix the Oakshotts with low volume text prints". After a few days, we will pick our favourite project suggestions and two people will received the pack they chose. All we ask of you is that you write a guest post for this blog containing photos of the finished item and a tutorial showing us how you made it within one month of receipt of the Oakshotts. And if you don't get picked this month, don't worry, there will be another great bundle on offer soon so stay tuned. I would choose the Dusk (Impressions) and would love to make a quilt from Portholes in all different sizes! I'd love the midnight blue bundle to make another Mariner's Compass Quilt- a modern mini! Oh wow - these are totally gorgeous! I can see bright white stars sprinkled across an improv pieced background of the Midnight bundle - I think that would make a stunning quilt/wallhanging. It would also be really fun to do a tutorial on mixing precious piecing with improv. Damn, I really want these now! Love the Dusk group. I'd (finally) attempt to make some New York Beauty blocks. Paper-piecing is still weird to me, but I'm trying to figure it out. I see 2 sets of 4, grouped together to make 2 pillows. I would use at least 4 different variations of the block to give it even more interest since the fabrics are so wonderfully subtle (unlike my usual combination of crazy colors and prints). They would look lovely with our peachy-colored walls. The Dusk bundle has a very art deco feel to me - I'm thinking an art deco building or pottery from that era would make a good subject for a quilt made with those fabrics. I would pick Midnight...it would look fantastic in a Giant Dahlia. But not enought fabric for that large of a quilt. I would make a hexie baby quilt. I would love the try the Dusk group for a pattern I call Hidden Ninepatch where the colors blend together from one block to the next. I think the Midnight group would be wonderful for a blended pineapple design similar to some I have seen by Jane Hall. That is a hard choice, for the midnight group....It reminds me of the universe/space so I think it would look great in a displacement quilt. For the dusk, I would do a improv wonky Chevron blocks of various sizes using the grey as background to the blocks. I love the Midnight colourway and would love to make a Bear Paw design with it!! I've never made this block nor a tutorial but would welcome the challenge and opportunity! Thanks!! Oooh, that midnight bundle is calling to me! I would make lots of slightly wonky log cabins and sneak in a few random pieces of bright yellow with it! I would love to make a patchwork colour blocked dress foe my daughter using the dusk bundle, mixed with th Nordika range of fabrica by Jeni Baker and using the Oliver +S Ice Cream dreas pattern. Love the Midnight bundle! I'd like to try a modern take on appliqué and see a lap quilt with the gorgeous midnight fabrics as the background. I'm thinking bright flowers and birds on top of that. Thanks for the chance! Less blocks and more negative space! They are quick and easy blocks and I've already done some! I might have to do this now! Oh I'd love to turn that Dusk bundle into a cute garden scene with little flowers and butterflies. The midnight bundle would make great stars. Wonky stars in all sizes scattered just like the night sky. Love them both but if I had a choice it would be 'dusk'. I would love the midnight bundle, I would love to use it to make a wall hanging using the broken dishes block, I think the low contrast between the fabrics would blend beautifully. I would love to use either bundles for a Trip Around the World wall hanging. The project would have four smaller blocks rather than one large one. I love both ...but I would love the midnight bundle to make a wonky curves quilt. I just love the ones I see on the web and want to give it a try! Thanks for the great give away! I love the colors of both. I would use the dusk to make a maxi skirt using strips and blocks to make it appear quilted. With a matching reusable grocery bag for my next trip to the farmers market. I would use elastic thread to sheer the waist of the skirt and make it high waisted. Some quilt blocks of maybe log cabin would be mixed in with some solid blocks of color. Though I have to say, those dusky greys would make for such an interesting twinkling trail behind the stars... Muted rainbow hues -- ah! Perfection! So I know you said to choose one... seeing as I'm not the first to picture stars propped up against the (aptly named) midnight blocks, let's go with DUSK and make it more of a daydreamy affair. Thank you both for the chance! I ve got some new leaf cutters coming and a midnight bundle on black? Would be striking. Thank you! The midnight. The Oakshott would be the background for bright flowery 6 inch churn dash blocks. Kin of scrappy with all the different backgrounds. Thanks for the opportunity to virtually create. A while ago I saved an applique BOM pattern called Vintage Tiles by Dorothy Baker onto my computer. The blocks are lovely and I would love to use the Dusk range of fabrics to make a couple of the blocks into new couch cushions for my living room. I would love to use the dusk fabrics along with some white or cream solid to make a subdued hashtag quilt! I would love to win either bundle - both would be perfect for making square dance quilts and/or bags with black or navy as the background. I have purple and blue floral prints that I have been collecting since the 1980s. I am cutting them into squares, then adding wide contrasting floral strips to all four sides to frame them. Adding another row of narrower strips with the oakshott cottons would ground each unit and create a nice transition to quiet the background. I plan to make a twin/full size quilt and would love to use the midnight bundle of fabrics. I am at the inlaws for the weekend and I have realised they don't own a quilt! My mother in law fell in love with one on a holiday to Lancaster county many years ago but couldn't afford it. I think it would be wonderful to make them a traditional Amish quilt but using the Oakshott paired with liberty prints. The two substrates would work so well together and the colours in the Oakshott dusk would pair beautifully with liberty florals and a lone star quilt to show of the colour graduation in the collection. A lovely twist on the traditional quilt and I know these special fabric would make a special quilt for my lovely mother in law! The midnight bundle is the one I'm drawn to. I'd make an Amish inspired wall hanging of stars. I'd use a single colour for each of the five stars , keeping the pieces as large as possible to show off the colours. The rest of the bundle would be the backgrounds and borders. I would choose the light bundle and use the F8 for the arches and/or cornerstones along with darker fabrics from my stash to make a quilt similar to the one I just finished, Ring Around the Briar Rosies, a modified churn dash original-ish design using my QCR. I'd have to re-name it Halo or Aurora because the subtle shades in Oakshott would create luminous rings. 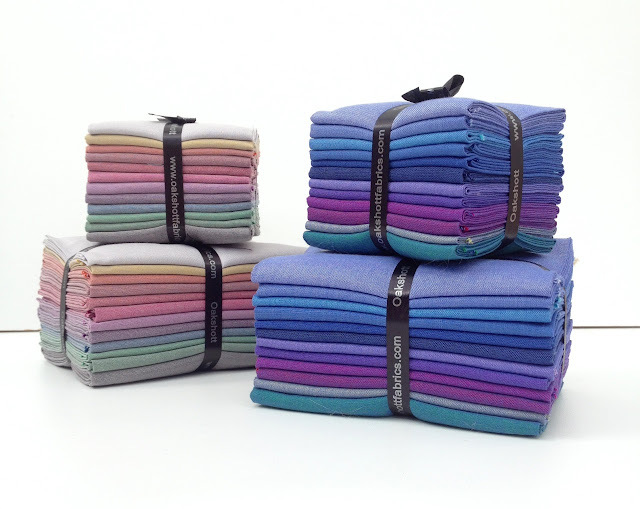 I think the dusk ones would look fab as a rainbow strip down the centre of a grey shift dress with princess seams. I've been wanting to make a quilt to test how Oakshotts work with voile and Liberty London fabrics. I could use either bundle as my main intent would be to test how the fabrics work together. I would love to play with the dusk bundle. I usually go for really bright saturated colours so it would be good to get out of my comfort zone and use something different. After doing an Improv class at FQR last weekend I would love to let go and make something fun using the skills I picked up. The great bit about improv is no scrap is too small and all the fabric gets used. I would make blocks and put it together as a mini quilt. I have been planning to make some stripy sports themed cushions for the men in the family, the midnight bundle would be perfect for them! what glorious colours. When I see the stack on the right, the 'midnight' one, I automatically think of the colours in some of Monet's paintings of his garden. I'd like to use those colours, and the tulip pattern at Bee in my Bonnet (http://www.beeinmybonnetco.blogspot.com.au/2013/03/the-bee-in-my-bonnet-row-along-row.html). How stunning would that look! Wow, fingers crossed. I neglected to mention that I prefer the darker (midnight) bundle. I would love to make a gradation quilt using the midnight bundle. You can see the concept I have in mind here on my blog. I made a small quilt in hot colors from my scrap bin but something like that made in these Oakshots?! Yum!!! I'd love to do dusk in a metal frame clasp purse. I'd do some EPP for the exterior. I'd choose Dusk, and I'd make a small spinning log cabin quilt like this one. I think that if I got the chance to play with those gorgeous blues and purples (midnights) that I would make a pixelated heart quilt, with the heart being low volume prints and using the oakshotts for the background! So think inverted heart, at least that's what I'm invisioning! Thank you for the chance to play with these lovelies!!! The dusk bundle reminds me of a lower value rainbow, so if I were to win that bundle I think I would make my daughter a pillow, with a rainbow of some wonky stars! I'd love the dusk. Just saw a pattern for a disappearing four patch. I think my aunts would love a quilt in these colors and the easy pattern would make it go quickly! Dusk! Yes, I would have to go with Dusk! And I would cut 2-1/2" squares to make 16-patches, at least 30 of them and put them together for a very colorful, visually soothing quilt. After I enjoy hanging it in my living room for a couple of months, I would donate it to a senior living facility in my area. The people there don't have much and are so grateful for anything (especially pretty) that comes their way. Adding fabric for a fussy cut center, I would make a doll quilt in a square in square pattern out if the dusk color way, or using the midnight I would make a doll quilt sixteen patch style adding prints for the second color of each block. I've had my eye on these Oakshotts for awhile now, and I'd love a chance to get my hands on the midnight bundle. I saw Anne's tutorial for the gentle curves, and I think I'd like to try something like that, and it would be so pretty in the midnight colors. The midnight pile reminds me of the colours the ocean. It makes me want to make a quilt that blends gently through those delicious colours, highlighted with sparkling jewelled fishes - like the Rainbow Fish children's books, if you ever read those. I would play with pleasure with the Dusk pile, I love these soft colors. I think I would try to do a pieced table runner mixing these gorgeous fabrics with text or geometric prints and would add little shishas and floral embroidery. Oh man! These are gorgeous!!! I love the blue midnight bundle! I would throw in some fun prints and make a clamshell pillow will some hand stitchwork. It would so pretty! With the dusk bundle..I'd pick a great matching low volume print, cut up some half square yrisngles and make a fun pouch for my makeup...with a matching zipper to one of the colors of course! I'd love to make log cabin blocks with the midnight fabrics as the centre squares surrounded by low volume fabrics. I would choose and use the Midnight Bundle together with a deep indigo or black to create a tunic. On the 'sky' of deep indigo would be in random 'floating' placement, small versions of some of my favorite quilt blocks...such as 9 patch, Greek Cross, Star Blocks, Dresden, Flying Geese, Bow Tie....basically I will use traditional blocks on a small scale sporadically tossed across the surface of the tunic. I would also choose the Dusk Bundle together with rich luscious fabric from the 'brown' family to create a tunic. And make a similar tunic as the one I would create with the Midnight Bundle I mentioned above but using applique and embroidery to embellish the tunic with a flurry of fall leaves. I happened on an old patch working book today while op shopping that has a delightful pattern for an off centre Amish quilt. The simplicity if the design would be amazing in these oakshot blues and if needed the shots could be complemented with some Japanese fabrics from my stash. A cross cultural quilting exploration! I adore vintage sheets and the dusk bundle could pull together some of the gorgeous sheets in my collection, giving them the space to pop or compliment as needed! A simple scrappy postage stamp in checkerboard style would be amazing in its simplicity and femininity. The Dusk bundle could make a lot of dolls/stuffed toys for the Fluff Project (http://hopefulthreads.blogspot.com/p/fluff-project.html). I'm doing an FY14 Charity Sewing Project and the Fluff Project gets the bulk of what I make. I like to use different patterns I already own (or find for free online). Any of the colors would work for seahorses or dinosaurs. Or peanut dolls (really basic shaped dolls good for younger kids). Or that gray might make a really cute kitty. I love the low volume! I want to make the Heirloom quilt from Simply Fat Quarters and I love the idea of that one in low volume! I also want to make the Spa quilt from Simply Fat Quarters (can you tell what book I just bought!?) I think these beautiful blues are just what the quilt calls for! Thanks for the chance to win! I would love to use the Midnight fabric in a Medallion Quilt I am making for a dear friend. She has been a great support to me lately, plenty of cups of tea. I am taking inspiration from Sarah Fielke, "Hand Quilted with Love," and her quilt "All that and the hatter" using the teapot as the centre and the mugs for one of the borders. I am also using "Making Welsh Quilts" by Mary Jenkins and Clare Claridge for further inspiration. I love the look of Sarah's quilt and I too shall combine the Oakshotts with Liberty fabric. The midnight collection will add so much to this. Thanks! The Dusk collection would work just as well in the quilt I have described in comment 74. Thank-you!! Pick me! Pick me! I still haven't used my ideas. Thanks! I'm new at this, but I know that I love modern takes on traditional quilt blocks. The Dusk collection reminds me of the way the light at sunset plays on all the buildings in lower Manhattan (I'm in Brooklyn). So I think I would do a version of the Courhouse Steps block. Oh, how wonderful! With the Midnight collection, I think I'd like to try a Beach Glass Quilt, with the pattern from "Quilts Made Modern". And actually use it at the beach! We have beach bonfires frequently at Golden Gardens beach just north of downtown Seattle, and every year I make a new beach blanket to use (a summer of sand, charcoal, saltwater, seaweed, s'mores, music friends and food, and lots of happy memories is tough on a blanket!). Mariner's compass block with flying geese around compass with leftover pieces as a half square triangle background of random color placement. See judy Mathieson books with paper piecing. Looking at pattern 8 -Twilight Star. I love that blue bundle. It would be perfect. Dusk is lovely! I have a clamshell applique pillow top design in mind with a woven neutral backdrop. I think it would be PERFECTION! I would use the dusk bundle with some romantic florals to make a scrappy trip around the world. The midnight bundle would be great to add to some other brights to make a series of miniature Amish quilts as well as some small abstracts - inspired by a recent workshop with wonderful Gwen Marston. I love the bloom and soft definition that the Oakshotts have - reminds me so much of the soft wools used in some antique Amish quilts. I love these fabrics! I'd use either bu del to make an abstract landscape quilt. That's way out of my comfort zone as I've been more of a pieces, but I've recently seen some art quilts that used small blocks of color to construct abstract landscapes and I love them. I'd love the dusk bundle to be used in stripes on a quilt, like looking at a sunset, but using the oh Fransson method of sewing together lots of little squares to give the texture. The midnight bundle would have to bee used to create a tree quilt using Helen's tutorial from her blog. I'd love to use the midnight bundle as a square pillow cover. I have the design in my head, but it's hard to describe. I would make a folded log cabin mini quilt with the midnight, arranging the colours in squares to get a 3d effect and showing of the fabric. I have some pale silvery oakshott greys to add in. It might even work! I would love the Midnight pack so that I could make more of "Best of British" blocks I am currently making, as seen here at http://thehexyladies.blogspot.com.au/2013/08/new-love.html - whilst they are a basic 16 patch of Oakshott and Liberty, the combination of the two is without doubt the very "Best of Britain" fabrics.